The Russian Defense Ministry reported on Friday that two Russian Navy warships and a submarine fired six Kalibr cruise missiles on Daesh targets in Syria. "The Russian Navy's Admiral Essen, Admiral Grigorovich frigates and Krasnodar submarine launched six Kalibr cruise missiles from the eastern part of the Mediterranean Sea on Daesh terrorist group targets in Syria," the ministry said in a statement. The statement noted that the Krasnodat submarine carried out a submerged launch of the missiles. According to the Defense Ministry, the Russian Aerospace Forces destroyed the remaining Daesh positions in Syria following the Kalibr launches. "The Russian Navy again demonstrated its capabilities of effectively attacking the remote targets by using the complexes of high-precision weapons such as Kalibr in the shortest possible time after receiving the military order. […] The remaining Daesh terrorist fighters and targets have been destroyed by Russian Aerospace Forces bombers' airstrikes," the statement read. 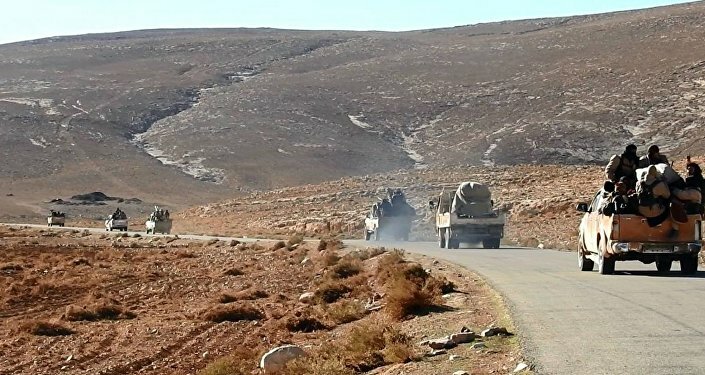 The Russian military stated that the launched missiles destroyed Daesh command posts and large weapons caches in the Syrian eastern province of Hama. "As a result of a surprise saturation missile attack, Daesh command posts, as well as large ammunition depots, have been destroyed in the vicinity of the town of Akerbat in the province of Hama, where a militant arsenal detonated after a pinpoint hit by the Kalibr cruise missile," the statement read. In advance of the missile launches, the Russian military informed Turkey and Israel. The Russian missile strike was delivered amid an ongoing offensive by the Syrian Army. 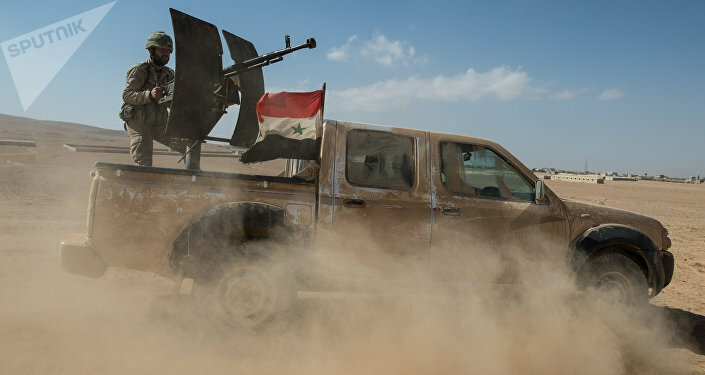 Earlier, Syrian forces drove Daesh terrorists out of five areas in the southeastern neighborhood of the Syrian capital of Damascus. The recent developments are contributing to the continuation of the peaceful settlement process in the war-torn country. Meanwhile, the Russian Foreign Ministry reported that de-escalation zones in Syria have been agreed by the guarantors, including Russia, Iran and Turkey. "It may seem that the use of sea-based cruise missiles [in the Syrian operation] is excess because the Kalibr is designed for more complex and technically advanced missions. It is capable of destroying a target at a distance of up to 2,600 kilometers, bypassing air and missile defense systems. They have been used against Daesh because Kalibr missiles guarantee the destruction of enemy targets. However, there are some additional factors," Russian political analyst and commentator Alexander Khrolenko wrote in a piece for RIA Novosti. Prior to the recent attack, the Russian Navy's Admiral Essen frigate and Krasnodar submarine launched four Kalibr cruise missiles from the eastern Mediterranean Sea and targeted Daesh terrorists in the area of Palmyra on May 31. Kalibr cruise missiles have been used by the Russian military to fight Daesh in Syria since 2015. The missiles were used for the first time on October 7, 2015, when the Russian Navy first joined the Syrian operation. The Dagestan, Grad Sviyazhsk, Veliky Ustyug and Uglich warships launched 26 cruise missiles from the Caspian Sea and destroyed 11 Daesh targets. Day and night monitoring of the situation on the ground in Syria proved the relevancy of a massive pinpoint missile strike on Daesh targets in Hama. At the same time, the Krasnodar submarine carried out a submerged missile launch. According to Khrolenko, that was a tactical move calculated not only with account of Daesh presence in the region. "In the Mediterranean, it is not only about demonstrating the Russian Navy’s capability. We’re witnessing efficient counterterrorism efforts and systematic practicing in launching sea-based cruise missile amid massive maritime and aerial presence of military force of the United States and NATO," Khrolenko pointed out. Moscow and the West have different views on the situation in Syria. Following the downing of a Syrian Su-22 near Raqqa by US-led coalition forces a week ago, Russia put a halt on all interactions with the US within the framework of the memorandum on preventing incidents in Syria. Moreover, after the Russian Defense Ministry warned of radar tracking of aerial targets in Syria, the international coalition suspended flights to the west of the Euphrates, except for Raqqa. According to Khrolenko, the US-led coalition in Syria is acting under anti access/areal denial (A2/AD) conditions provided by Damascus’ allies, including Moscow and Tehran. The author noted that demonstration of Russian advanced weapons in Syria, including the Kalibr cruise missile, is aimed at preventing the US and its allies from any reckless moves on the ground. "In fact, the US-Russia standoff in Syria only serves the interests of Daesh. Russia’s presence in the region is legitimate while the coalition engagement was not authorized by Damascus. If Washington wants to have a role in the division of Syria, then Russia’s advanced weapons are needed to protect Syria’s sovereignty and territorial integrity," Khrolenko concluded.